Ever since former president George W. Bushreferred to the war on terror as a “crusade” in the days after the September 11 attacks, many have charged that the United States was conducting a holy war, pitting a Christian America against the Muslim world. That perception grew as prominent military leaders such as Lt. Gen. William Boykin described the wars in evangelical terms, casting the U.S. military as the "army of God." Although President Obama addressed the Muslim world this month in an attempt to undo the Bush administration's legacy of militant Christian rhetoric that often antagonized Muslim countries, several recent stories have framed the issue as a wider problem of an evangelical military culture that sees spreading Christianity as part of its mission. In the aftermath of that report, the Pentagon responded that it had confiscated and destroyed the Bibles and said there was no effort to convert Afghans. But while the military dismissed the Bagram Bibles as an isolated incident, a civil-rights watchdog group, Military Religious Freedom Foundation (MRFF), says this is not the case. 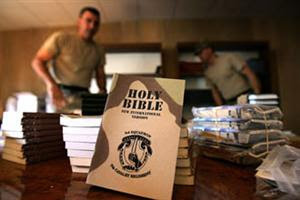 According to the group's president, Mikey Weinstein, a cadre of 40 U.S. chaplains took part in a 2003 project to distribute 2.4 million Arabic-language Bibles in Iraq. This would be a serious violation of U.S. military Central Command's General Order Number One forbidding active-duty troops from trying to convert people to any religion. A Defense Department spokeswoman, in an e-mail to NEWSWEEK, denies any knowledge of this project. The Bible initiative was handled by former Army chaplain Jim Ammerman, the 83-year-old founder of the Chaplaincy of Full Gospel Churches (CFGC), an organization in charge of endorsing 270 chaplains and chaplain candidates for the armed services. Ammerman worked with an evangelical group based in Arkansas, the International Missions Network Center, to distribute the Bibles through the efforts of his 40 active-duty chaplains in Iraq. A 2003 newsletter for the group said of the effort, "The goal is to establish a wedge for the kingdom of God in the Middle East, directly affecting the Islamic world." J. E. Wadkins, vice president of student life at Ecclesia College who oversees the International Missions Network Center, says they have worked with Ammerman for 20 years and reached out to him as part of their "Bibles for the Nations" mission. He estimates that in the end, between 100,000 and 500,000 Arabic Bibles were distributed in under one year, beginning not long after Saddam Hussein's ouster. "It was a really early effort there," says Wadkins, "when things first opened up." The effort is an example of what critics call a growing culture of militarized Christianity in the armed forces. It is influenced in part by changes in outlook among the various branches' 2,900 chaplains, who are sworn to serve all soldiers, regardless of religion, with a respectful, religiously pluralistic approach. However, with an estimated two thirds of all current chaplains affiliated with evangelical and Pentecostal denominations, which often prioritize conversion and evangelizing, and a marked decline in chaplains from Catholic and mainstream Protestant churches, this ideal is suffering. Historian Anne C. Loveland attributes the shift to the Vietnam War, when many liberal churches opposed to the war supplied fewer chaplains, creating a vacuum filled by conservative churches. This imbalance was exacerbated by regulation revisions in the 1980s that helped create hundreds of new "endorsing agencies" that brought a flood of evangelical chaplains into the military and by the simple fact that evangelical and Pentecostal churches are the fastest-growing in the U.S. The chaplains minister to flocks that are, on the whole, slightly less religious than the general population and slightly less evangelical. According to a 2008 Department of Defense survey, 22 percent of active-duty members of the military described themselves as evangelical or Pentecostal (although the actual number of evangelical-minded believers is likely higher when encompassing personnel who follow more evangelical expressions of mainline Protestant denominations, as well as a sizable percentage of the additional 20 percent that describe themselves simply as "Christian"). Among the "endorsing agencies" is CFGC, which represents a conglomeration of independent Pentecostal churches outside established denominations. The group was accepted as a chaplain-endorsing agency by the Department of Defense in 1984, two years after it first applied. Since 1984, MRFF charges, Ammerman's agency has violated numerous codes that govern chaplaincies, including a constant denigration of other religions, particularly Islam, Judaism, mainline Protestantism and Catholicism, but also non-Pentecostal evangelical churches. In a 2008 sermon, Ammerman described a CFGC chaplain at Fort Riley, Kans., who demanded the 42 chaplains below him "speak up for Jesus" or leave his outfit. In a video for an organization called the Prophesy Club, CFGC chaplain Maj. James Linzey called mainstream Protestant churches "demonic, dastardly creatures from the pit of hell," that should be "[stomped] out." But the primary target of CFGC's ire is Islam. A 2001 CFGC newsletter asserted that the real enemy of the U.S. wasn't Osama bin Laden, but Allah, whom the newsletter called "Lucifer." A 2006 issue argued that all Muslim-Americans should be treated with suspicion, as they "obviously can't be good Americans." In a 2008 sermon, Ammerman called Islam "a killer religion" and Muslims "the devil." Ibrahim Hooper, communications director for the Council on American-Islamic Relations, says it's "counterproductive to the interests of our military to have officers or servicepeople proselytizing. It should be addressed at the highest levels of the military." Hooper says that while he can't say whether events such as these constitute a systematic problem in the military, "we've certainly seen enough incidents for it to be a concern."